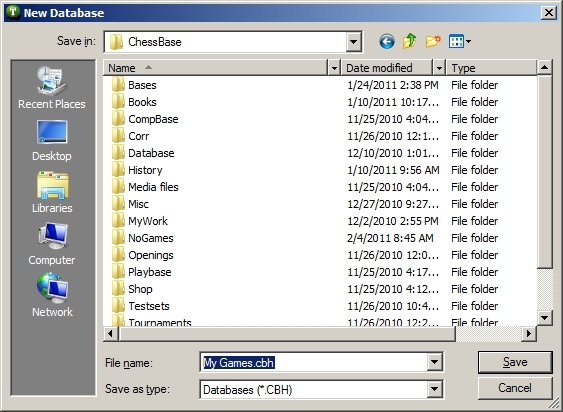 One of the first things new users of Fritz and Rybka usually do with their software is to create a database of their own games. I did this myself, back in 1992 when I received my first copy of Knightstalker (Fritz1). 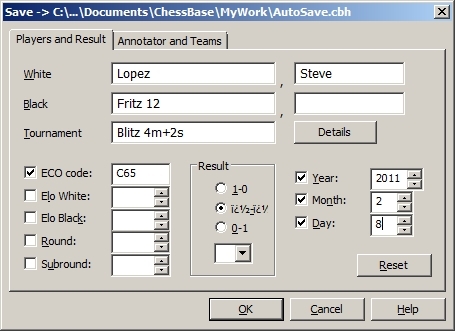 This is a pretty beneficial use of the software; when you’re done entering and saving your games, you can start to have the chess engine analyze them. But how do you create a database and input your own games? After you click the “Save” button, your new database will be created. The next step will be to manually input your games. This is the step with which new users typically have problems, because every time they make a move on the chessboard, the chess engine will make a move in reply. How does one turn off the chess engine? This command acts as a “toggle” to switch the chess engine on and off. 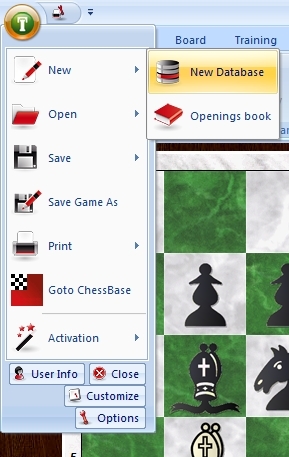 Clicking it will place a check in the box (as seen in the illustration above), indicating that the chess engine is turned “off”. 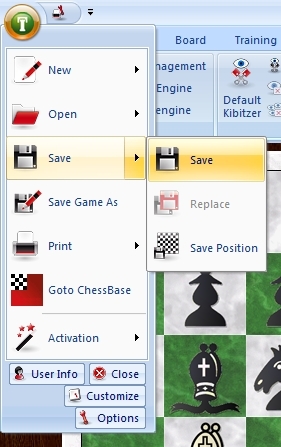 Clicking this command again will clear the check from the box, which indicates that the chess engine has been switched back “on”. As long as the engine is switched “off”, you’ll be able to make moves on the chessboard without the chess engine making a move in reply. After you’ve switched off the engine, you can make moves on the board by clicking on a piece and holding down the left mouse button. Move the mouse cursor to the square to which you want to move the piece and then release the left mouse button. The piece will be dropped on the square. Fill out the various header fields (player names, tournament, year); note that the ECO code will already be filled in for you. Note, too, that any and all header information is optional – you do not have to fill in every single one of the headers fields. But as a general rule, you should at a minimum fill in the player names, tournament (or geographical location if the event didn’t have a name), and the year. Then you’ll just click the “OK” button to save the game into your new database. Repeat the process for each game you want to save. You’ll discover that you’ll become quicker and better at the process the more you repeat it. Experienced users can typically input and save a game in three to five minutes. USCF Sales is currently running a massive blowout sale on Fritz12 and Rybka4! Purchase either of these programs from USCF Sales and receive free technical support for them. Snippets : There will be sub-headings: Snips * * * Snaps * * * Oddies. Definitely have a treasure house to delve in: Just wait and then ponder pls. Happy matings to all who browse this rambling. Consider registering & learn of benefits that will flow to you; without having to spend a “razzoo”. But remember: “Patience is a virtue; possess it if you can. Always in a woman (so they say); seldom in a man (debatable)”. Website is: http://www.wyvchessacademy.webs.com NB: Birthing at present. thoroughly enjoy the “Bread that will be thrown upon one’s waters”. And oh: The path is sweet. Any tips on how to use the engine to analyze the game in such a way that one can print out the result with diagrams and other interesting diagnostics that the engine provides?